The period of the British Raj in India is a fascinating time and I’ve read two books recently that used it as a backdrop to criminal events. The first probably needs no introduction to readers of this blog. Wilkie Collins’ The Moonstone is, of course, considered to be one of the first British crime novels. But the moonstone of the book’s title is a large diamond stolen by an army officer which results in three Hindu priests coming to England to reclaim it. It’s an excellent novel and I very much enjoyed rereading it over the summer. The second book, however, is a recent novel by Australian writer Brian Stoddart. 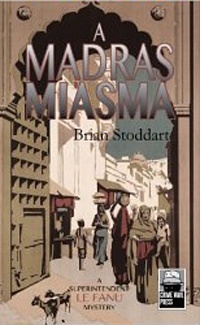 A Madras Miasma features Superintendent Chris Le Fanu of the Special Crime Unit in the Indian police and his sergeant Habibullah who investigate the death of a young British woman. The dead woman had come to India as part of the ‘fishing fleet’ looking for a husband amongst the officers and other colonial officials. However, British rule in the country is under pressure and, as tensions mount, Le Fanu becomes embroiled in a political scandal reaching to the top echelons of Madras society. You can usually tell from the first page the quality of an writer’s prose. 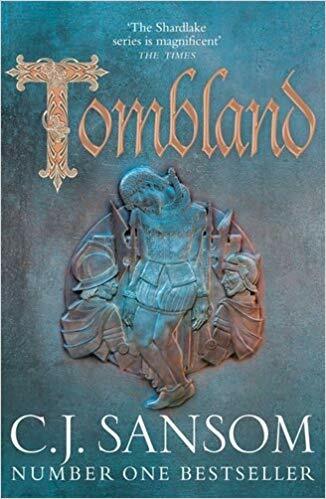 Brian Stoddart is already the author of a couple of non-fiction books and his writing is excellent. It’s exactly the sort of prose I like to read: tightly constructed sentences within a more free flowing narrative. The murder plot, the killing of Jane Carstairs, provides a fascinating insight to Madras life at that time. British women, nearing their thirties, would come to India on the search of a husband and the phenomena is both socially accepted and widely derided. Le Fanu is separated from his wife and having a relationship with his servant, Ro, an Anglo-Indian. Stoddart details the problems of women of mixed British and Indian ancestry who are forbidden access to either society. Ro is a sympathetic character whose education hardly helps her progress beyond the restrictions imposed on her. The political troubles, combined with what turns out to be particularly vicious murder, makes this a page turning read and I found myself thinking about the book when I wasn’t reading it. For me it’s a sign of a good novel and I’m looking forward to the sequel which I believe is out this year. Thanks to the author for my copy. I see that on Amazon.com (US) you can get the book new for $12.45 and used for a mere $41.34. Huh? I buy a lot of second hand books and the prices give me a headache. I’m trying to get hold of a copy of Cortazar’s ‘Around the Day in Eighty Worlds’ and some of the prices are making me wince. Thanks so much for the lovely review. I am delighted you enjoyed it and, yes, the second one in the series is on track for later this year from Crime Wave Press. And I can’t figure the used price either! My pleasure, Brian. As I mentioned, looking forward to book 2. Thanks for reviewing this one. I read the sample and went ahead and bought in Kindle edition. This sounds very interesting. Great news, Keishon. I’ll look forward to the review. Sarah – You’re now the second trustworthy person who’s recommended this one to me. I think that must be a Sign I ought to put this on my list. I find the time period fascinating myself, but I don’t know enough about it. It sounds as though this book is also well-researched? It’s very well researched, I suspect. I love the detail about the ‘fishing fleet’. Very nice review, Sarah. Definitely sounds like a book I would like to try, but will have to put it off for a while and get through some of my TBR pile. Thanks Tracy. Good luck with the reading. This sounds very much my sort of book and I shall be looking for a copy straight away. I read a non fiction book about the Fishing Fleet earlier this year which I enjoyed much more than I expected to and this would seem to be an excellent complement to it. Wonderful. I’d never heard of this before. I’m sure you’ll love the book. I’m very interested in the historical and cultural background of this mystery. I’ll definitely be looking it up! Great, Judith. I hope you enjoy it. Lovely to hear from you. Sarah, this is definitely going up on my list of books to read. I have not read a lot of fiction set during the Raj as much as I have read nonfiction owing to my interest in India’s freedom struggle that began in late 19th century. Thanks to the internet and legally downloadable books, I have read some interesting nonfiction, particularly records and memoirs, about India, written by Englishmen who were posted here during the period. Many of these books focus on the people and their way of life. Madras (now renamed Chennai) is the capital city of the southern state of Tamil Nadu, and socially, culturally, politically, and economically, it’s as important now as it was during the Raj days. I don’t think there is any Indian city which is not historically relevant in the context of the British occupation or otherwise. Thanks for a fine review, Sarah. Thanks, Prashant. And I did have you in mind when I was reading this, partly because of where you live but also, of course, because of your love of well written crime fiction. I know very little about Madras and I do feel that have been educated, in the best possible way, in some of the politics of the time. I’d love to hear what you think of the book when you read it. This sounds excellent – when I’ve come to the end of my current embargo, I think I must get hold of it.. thanks for great review Sarah. Hailing from Tamil Nadu/Madras I can relate to the premise of this novel immediately, just hope that the novel does not do the stereotyping of the ‘natives’ as many such novels tend to do :). Madras celebrated its 375th birthday very recently (in Aug) and it was one the earliest settlements of the British. Robert Clive sowed the seeds to British imperialism here in the South and It would be surprising for quite a few to know that the first British Regiment in India was created at Cuddalore, some 175-200 odd kilometers from Madras. Then due to various factors Calcutta and then Delhi became the power centers. As a digression, I would suggest also ‘White Mughals’ by William Dalrymple. Glad you enjoyed this one. It’s my next read but one, so I’ve only skimmed your review! It will be my first reading trip to India, which is the closest I’m probably going to get! Great! I’ll look forward to the review, Col.